Traditional French appetizers offer a wonderful chance to sample a wide variety of easy French cooking including simple dips, caviars, tapenades, gougères, brochettes, bouchées, verrines, canapes, quick breads and other wonderful amuse-bouches. In France an appetizer might be served along with an apéritif, the traditional before dinner drink. 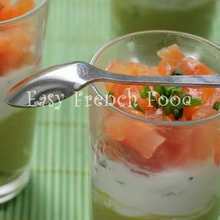 These noshes are sometimes called les amuse-bouches, or more informally, les amuse-gueules. They may be quite simple, especially if an elaborate meal is to follow. Sometimes though the hors d'oeuvres take center stage. An apéritif dinatoire will include enough appetizers to fill people up without actually having to sit down and dine. The portions are small, so that you can eat each appetizer in one or two dainty bites. Many times the food will be served in waves, maybe starting with canapés, moving to verrines, and then ending with sweets. 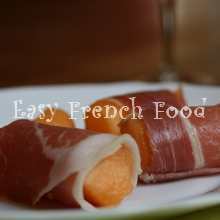 On the page here you will find a list of some of the more common French appetizers. If you are ready to start cooking, have a look at these Easy Appetizer Recipes. The French aren't above offering nuts, chips, or crackers with an apéritif. They'll also do cocktail weiners, raw vegetables, olives and slices of sausage. For an informal gathering, these simple amuse-bouches may be all that is needed to complete the affair. The emphasis after all is on the social aspect of relaxing with a drink and friends. Dipping is a new fangled idea in France. It clashes somewhat with the refinement they like to bring to any dining experience. It does seem to be catching on though as evidenced by the growing number of packaged dips in the grocery store. If a spread is offered as a French appetizer, it will normally be on top of a small piece of bread. A triangle of toasted bread with a spread is called a toast, and a more elaborate presentation, featuring several layers, is called a canapé. Blini, a small pancake originating in Russia, are also frequently used as a base for spreads. Fromage blanc - Just like sour cream does in North America, fromage blanc will serve as the basis for making any number of homemade dips. Mousses - Appetizer spreads that are typically made with salmon, sardines or tuna, but also other meats and vegetables. Rillettes - Rougher then a mousse and more like a paté, these are made from pork, poultry, rabbit or fish. Tapenade - This is black or green olive paste that is typically spread on grilled bread and served as an appetizer. Foreign Influence: Guacamole, humus and tzatziki are all well known to the French palate. Vegetable caviars: These spreads are concentrated tastes of various vegetables and include eggplant, tomato, and bell pepper caviars. Anything presented on a tooth pick or small wooden skewer could be considered a brochette. These are really only limited by the host's imagination, but a popular combination is a piece of raw cured ham wrapped around a small piece of melon or a prune. Recently there has been a wave of sucettes, or lollipops, served as appetizers. This might be a piece of cheese that has been grilled onto the skewer. Samosas and Nems - Two foreign bouchées that are a big hit in France. Ballotins - If you tie a few bits up with something else you get a ballotin. For example two or three short pieces of asparagus tied with a thin strip of Bayonne ham. Feuilletés - Anything appetizer made with puff pastry is a feuilleté. Might include cheese, but also meats and vegetables. Accras - Deep fried fish balls showing the Caribbean influence in French cooking. Roulés - Ingredients are layered, then rolled and sliced into hors d'oeuvres. 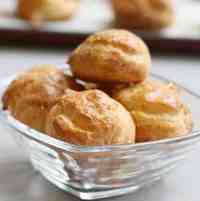 Gougères - Warm cheese puffs made from choux pastry. In recent years verrines have become very popular in France for appetizers. They are small glasses that contain two or three bites of some yummy combination. One uses a small spoon to enjoy the contents, which are truly limitless in their possibilities. A craze for cuillères, or spoons, has followed close on the heels of the verrine. Here a bite of food will be artfully arranged on a special spoon - many times these look a little like Chinese soup spoons. Allumettes - Puff pastry twists, usually with a sprinkle of cheese. Madeleines and Palmiers - These are usually sweet, but here they are made into savory appetizers. There is a definite trend to take what might have been served as dessert and relook it into French appetizers. Beignets - Fried dough that might include a vegetable or cheese. Foie gras is probably the most infamous of French appetizers. It is normally reserved for special occasions and might be served on top of small slices of spice bread. Mussels, oysters and caviar might also find there way into an apéritif offering. The French even make their own caviar these days - Osetra caviar from the Aquitaine region. Return from French appetizers to French foods.